VIT Business School has been recently accredited with the International Accreditation ACBSP. With this, the b-school has added one more feather in its cap. With two prestigious accreditation, ACBSP and AACSB, VIT Business School, the popular destination for students in South India aspiring for management studies, will be seen as truly global in various aspects – the quality of education, esteemed faculty and global exposure. The accreditation standards drive impact, innovation and engagement with students, employers, and various stakeholders. The standards are rigorous, relevant, and benchmarks of quality. Institutions that hold accreditation like the AACSB and ACBSP are committed to high quality and continuous improvement – a powerful differentiator which is accepted worldwide. VIT was the first institute in the country to have received the 4-STAR rating from QS, the International University Rating Agency in 2016 and also been the winner of the prestigious national award ‘University of the year– 2016” from FICCI. VIT ranked 17 in consecutive years, 2016 & 2017, in NIRF MHRD Ranking in the Management Category, and ranked 13 in consecutive years 2016 & 2017 in NIRF MHRD Ranking in the Engineering Category. In a bid to prepare its students to be able to work anywhere in the world, VIT has collaborated with 207 universities in different countries. 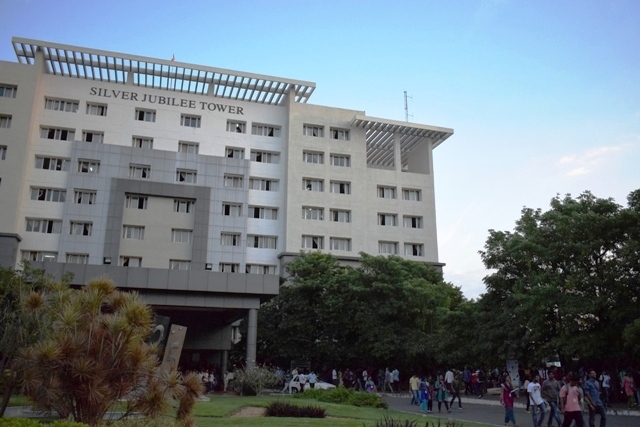 Campus, Infrastructure and Facilities: The university’s main campus in Vellore is situated on 300 acres of land and is a city in itself with a lake, gardens, lawns, residential complexes, food courts, hair salons, vehicles plying in the wide roads from one building to another, our own water supply and backup electricity supply. All of this along with shopping complexes, auditoriums, state-of-art infrastructure, libraries and research labs set up in collaboration with MNCs to cater to the needs of 30 thousand and odd students residing inside. There are 23 hostels located on the VIT campus. The hostel area includes an outdoor stadium, swimming pool, basketball courts, badminton courts, squash courts, tennis courts and an indoor stadium with table tennis and badminton courts. There are 17 Men’s Hostels, which accommodate 13000 students in single, double, three, four and six bedded rooms. A gym facility is also attached to a well maintained swimming pool. The 6 Women’s Hostels have room for 4300 students. Women students have access to gym facilities and a newly built swimming pool inside one of these hostel premises. Individual metering service, for those who want A/C facilities, is also provided. Optional washing services are provided in well maintained separate washing areas. Applications to the Business Schools are now open and can be applied online.